After November 1, 2015 our new main office address is 1031 McHenry Avenue Suite 17, in Modesto California 95350. Behind Garcia Jo Jo's on McHenry Avenue. Speedy Legal's prices are increasing As of January 1, 2017. Regardless; we will remain competitive in our pricing. If you are currently under contract for an active action, your price remains the same. This is for our new actions, excluding Bankruptcy with S.L. Speedy Legal will be closing this Sacramento office as of November 1, 2015 and be located in Modesto California only. We can still help our Sacramento friends and all of California through our Modesto office. * Proof of income for the past three months. * If you have exhibits you want to include, please bring 4 copies. If you need us to copy your exhibits then please keep in mind we do not have a color copier which can affect the appearance of your exhibit(s) and we will have to charge you for making exhibit copies. 2008 Clients: Your file has been destroyed. 2009 Clients: Your file has been destroyed. 2010 Clients: Your file has been destroyed. 2011 Clients: Your file has been destroyed. 2012 Clients: Your file will be destroyed at the end of December 2019. If you would like to purchase our copies of your file, please contact our office before December 31, 2019. Your name and phone number will be asked by our intake person to reserve a day and time to meet with us. At the time of meeting you will be given your Speedy Legal client number. After intake you will meet with your LDA (Legal Document Assistant). If you do not receive a copy of your signed contract (watermarked) and assigned client number at the time of meeting, then please call us and ask for our quality control. You must have a valid client number on a valid invoice from Speedy Legal to be a Speedy Legal client (See example of invoice on this page. Our Quality control team may follow up with you to make sure you recieved a call back and/or appointment, a signed contract and a client number. Please make sure all of your payments for our services are payable to "Speedy Legal" (Excluding Court fees which are made payable to "Superior Court"). 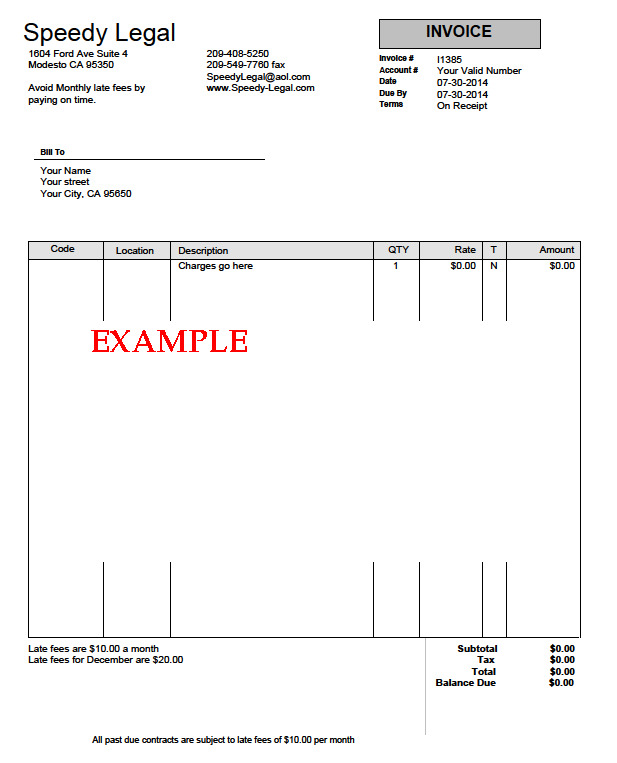 Each time you make a payment, you will receive a new invoice reflecting your new balance until paid in full. Our LDA's cannot accept payments made payable to the LDA's themselves as this would not protect you under our license or bond and would void your contract in its entirety and you may still be liable for payment. You are important to our Speedy Legal family. When leaving a message, please indicate what you are needing help with, eg: Divorce, change a court order, living trust, bankruptcy, etc. Please also leave your first name, telephone number and your email address. This will help us get you to the person who can assist you faster. If we do not answer your call right away, we still would like to hear from you, please leave us a message and our Speedy family will get back to you as soon as possible. We do not answer 800 or blocked numbers. Speedy Legal will be exiting all phone book advertisments and focusing on online advertising only. If we need to advertise we will contact you, please do not call our offices. Thank you. We are not Attorneys. Speedy Legal Document Assistance is not a law firm. We cannot represent you in Court, advise you about your legal rights or the law.